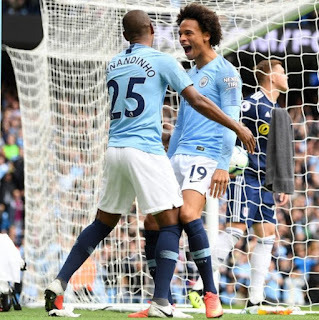 Leroy Sane marked his return to Manchester City’s starting line-up in style as the defending champions eased past Fulham 3-0 to maintain their unbeaten start to the Premier League season. Sane, making his first league start for Pep Guardiola’s side this term, opened the scoring after one minute and 36 seconds with a simple tap-in from Fernandinho’s pass. Brilliant David Silva doubled the hosts’ lead before the break, with Raheem Sterling all but securing the win two minutes into the second half. A fourth win in five games keeps City within touching distance of league leaders Liverpool and Chelsea, who have taken maximum points so far. City were rarely troubled by the newly promoted Cottagers, restricting the visitors to handful of half chances at Etihad Stadium. The hosts, perhaps with one eye on Wednesday’s Champions League opener against Lyon, eased off the pace in the second half but could have added to their lead with a number of opportunities falling to substitute Gabriel Jesus.